This study provides information designed to aid sectoral social dialogue in the graphical industry. The study is divided into three parts: a summary of the sector’s economic and employment background; an analysis of the relevant social partner organisations in all EU Member States, including their membership, role in collective bargaining, social dialogue and public policy, and national and European affiliations; and an overview of relevant European organisations, particularly their membership composition and their capacity to negotiate. The aim of Eurofound’s series of representativeness studies is to identify the relevant national and supranational social partner organisations in the field of industrial relations in selected sectors. The impetus for these studies comes from the European Commission’s aim to recognise the representative social partner organisations to be consulted under the provisions of the Treaty on the Functioning of the European Union (TFEU). The aim of this representativeness study is to identify the relevant national and supranational social actors – the trade unions and employer organisations – in the graphical industry, and to show how these actors relate to the sector’s European interest associations of labour and business. The impetus for this study arises from the aim of the European Commission to identify the representative social partner associations to be consulted under the provisions of the Treaty on the Functioning of the European Union (TFEU) and which are eligible for participation in European sectoral social dialogue committees. The effectiveness of European social dialogue depends on whether its participants are sufficiently representative in terms of the sector’s relevant national actors across the EU Member States. and/or participate in the sector-related European social dialogue. The Commission may decide to include other EU sector-related organisations in the study, if relevant, for example a sector-related organisation which has recently requested consultation under Article 154 TFEU. 18.14 – Binding and related services. The information for the study is collected through 28 national contributions. Eurofound has a network of national correspondents with expertise in industrial relations in place, covering all Member States. These experts are required to gather data on all relevant organisations at national level and to approach them by telephone or email, using standardised questionnaires. While the questionnaires are in English, correspondents can interview or contact the organisation in the relevant national language. The questionnaires are completed by the national correspondents. European and national social partners are considered to be ‘sector-related’ if their membership domain relates to the sector in one of the ways displayed in Figure 1. Put simply, any organisation organising membership in the sector is deemed to be sector-related. A. The association’s domain relates to the sector. B. The association is either affiliated to a European-level organisation, which is analysed in the study within the top-down approach (independent of their involvement in collective bargaining), or, if not, it is regularly involved in sector-related collective bargaining. globalised competition – leading to job losses and structural overcapacity. According to a 2014 economic report by European Federation for Print and Digital Communication (Intergraf), the economic crisis has deeply affected the sector and no real sign of recovery has been recorded so far. Thus, volumes have continued to fall in the graphic print sector at a time when the packaging print sector has been recovering slowly. Data analysis carried out by Intergraf (2014) shows that the number of European printing establishments has continued to decline and employment levels have also dropped. With regard to the business strategies followed to cope with the crisis and with the long-term challenges, Intergraf (2014) notes that some businesses have tended to adjust their range of services to ensure that they are able to meet a more varied set of demands from their customer base, especially when it comes to quicker turnaround times in line with the growth of ‘just-in-time’ delivery practices, more demand for shorter run and variable print, and online buying. According to Intergraf, feedback from the industry suggests that printers are investing more time on ensuring that they are making the best use of any new systems they buy in, keeping the presses busy through a mix of long and short-run work and adapting their sales strategy as appropriate. This movement towards ‘just-in-time’ practices could lead to a situation where the amount of print being produced is becoming more adapted to the actual amount that is required. Although there are still some areas such as retail advertising where there have not been any significant reductions in waste, most of the areas record a more efficient process and this has, in some cases, allowed printers to command the same price for a print run that is slightly shorter. As far as the differences among the European Member States are concerned, Intergraf (2014) points out that printers in Western Europe will continue the effort to develop their business offer to bring in more added-value opportunities, while in Eastern Europe there is some scope for growth in areas such as printed advertising and even in some publication print – especially magazines. Bearing that in mind, it is also noted that for most of the countries, the major growth opportunities will be in printed packaging in line with rising demand for packaged consumer goods. The European graphical industry employed 814,900 people in 2013, representing around 0.4% of total employment in the European Union, according to the Eurostat European Labour Force Survey (LFS). Men make up the majority of employment, accounting for 68% of the total workforce. The large majority of graphical industry workers (87%) have employee status. (The definition of ‘employment’ is applicable to employees, self-employed people and family workers. The definition of ‘employees’ is only applicable to employees.) This supposes that self-employed people and other non-employee relationships such as family workers are slightly more extended than in the manufacturing sector as a whole (93%). As far as the business structure is concerned, the sector is highly fragmented since more than 90% of the companies are small and medium-size enterprises (SMEs) employing fewer than 20 workers (European Commission, 2014). Tables 1 and 2 give a general overview of the development of the sector from 2008 to 2013 (or the closest year with available data). Table 1 presents figures on total employment (2013), differences in employment from 2008 to 2013, female employment as a percentage of total employment in the sector (2013) and the share of sectoral employment as a percentage of total employment in the economy (2013). Table 2 presents data on the number of companies by country and differences in companies from 2008 to 2013. Most of the data comes from national sources. These figures have been collected through Eurofound’s network of European correspondents. Notes: Data are for 2013, unless otherwise stated. n.a. = not available. A full list of country codes can be found in Annex 2. Data collected through Eurofound’s network of European correspondents show that most of the countries have been affected by the crisis. Thus, all the countries with available data record a drop in employment from 2008 to 2013, apart from Malta. In Malta, sectoral employment increased by 17.5%. The country most affected by the crisis is Greece (-62%). The number of companies has decreased in 19 countries out of the 27 with available data for 2008 and 2013 or years as referenced. With the exception of Belgium, the number of companies increased only in those Member States that joined the EU in 2004 and 2007 (Bulgaria, Estonia, Hungary, Latvia, Malta, Slovakia and Slovenia). Generally, the decrease in the number of companies reflects a drop in employment, except in Estonia where the number of companies increased and employment fell. This may reflect a process of fragmentation of the sector’s company structure. The data in Table 1 also show that male employment is higher than female employment in all countries with available data. In addition, it shows that self-employment and other non-employee relationships such as family workers are widespread only in countries such as Greece (with more than 30% in 2013) and Belgium, (more than 48%). 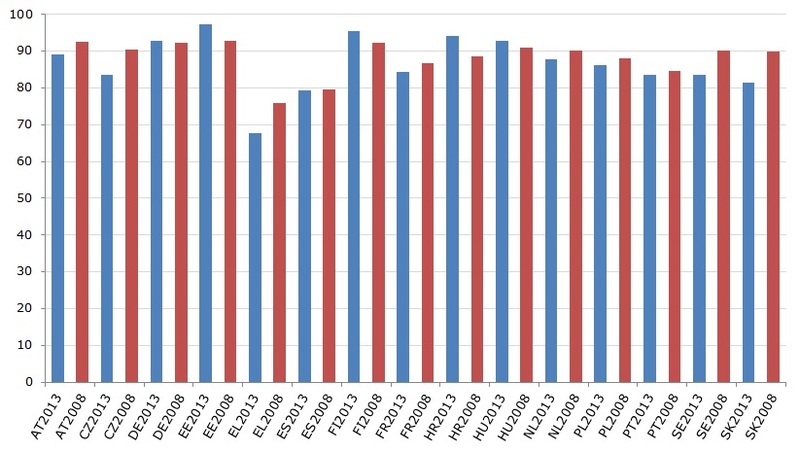 Figure 2 provides figures on employment trends from 2008 to 2013 extracted from the EU LFS. Data from the EU LFS do not vary greatly with regard to the data coming from national sources. For all countries with reliable data, a drop in employment is observed (figures from Malta were not reliable due to the small sample size). According to the EU LFS data, nine of the countries have been deeply hit by the crisis, recording a drop of more than 20% in employment: Greece, the Netherlands, Portugal, Romania, France, Slovakia, Estonia, Croatia and Spain. Attention should be drawn to the case of Croatia, where figures from a national source suggest a lower drop in employment (-8% vs. -31%). Figure 3 illustrates the share of employees in employment in the countries with available data for 2008 and 2013. The figures, taken from the EU LFS mostly corroborate figures extracted from national sources. They also show first, that self-employment and other non-employee relationships such as family workers are widespread only in countries such as Greece, with more than 30% in 2013 (figures from Belgium were not available). In the other countries, self-employment and other non-employee relationships appear to be low. However, it is worth noting that the share of employees in employment has remained relatively stable in the majority of the countries over the period. A significant change was recorded in Greece, where the share of employees in employment decreased from 76% in 2008 to 68% in 2013.
their role in public policymaking. This study will focus on the following quantitative data on membership and relative strength within the graphical industry, which were collected by Eurofound’s network of European correspondents. Sectoral density: Number of active members in employment in the graphical industry divided by the total number of employees in the graphical industry. Sectoral density (companies): Number of member companies in the graphical industry divided by the total number of companies in the sector. Sectoral density (employees): Number of employees working in member companies in the graphical industry divided by the total number of employees in the graphical industry. Tables A1 and A2 in Annex 1, present the trade unions’ data on their domains and membership strength. The tables list all sector-related organisations which are either involved in collective bargaining and/or affiliated to UNI Europa Graphical. At least one sector-related trade union has been identified in 25 of the countries. Bulgaria, Estonia and Slovakia do not record sector-related trade unions. In total, 55 sector-related trade unions are identified which fulfil the criteria for inclusion in the representativeness study. Only one sector-related trade union is recorded in nine countries, two in nine countries, three unions are observed in two countries, while five countries record four or more sector-related unions, thus showing a fragmented landscape. Accordingly, union landscape is non-fragmented in the majority of the countries although a pluralistic or semi-pluralistic structure exists in more than half of the countries (16 out of 25 countries). Some 45 trade unions, out of 50 with available information, are involved in sector-related collective bargaining (Table A2 in Annex 1). Accordingly, most of the trade unions identified in the study (90%) take part in collective bargaining in the graphical industry. However, in Greece, Latvia and Lithuania, no trade union is involved in collective bargaining because there are no collective agreements in force in these countries. Only six trade unions (around 11% of all the unions) demarcate their domain in a way which is congruent with the sectoral definition (see Figure 4 and Table A3 in Annex 1). This implies that statistical definitions of business activities of the sector differ from the lines along which employees identify their interests. 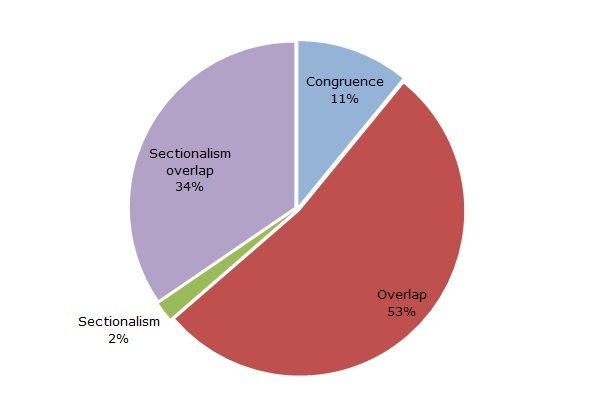 Sectional overlap occurs in 34% of cases (19 trade unions). This is often a result of domain demarcations which focus on certain categories of employees which are then organised across several sectors, including activities outside the graphical industry. Employee categories are specified by various parameters, mostly related to employment status, such as white-collar workers (SETCa – BBTK and LBC-NVK in Belgium, Pro-liitto in Finland, Unionen in Sweden), blue-collar workers (Irish Print Group and Unite in Ireland, GS and SEKO in Sweden) or more specific groups, such as blue-collar workers and white-collar technical workers in the case of ACV-CSC BIE in Belgium. Several unions only cover the private sector (OVIEK-SEK and SEVETTYK-PEO in Cyprus, Unionen in Sweden, SETCa – BBTK and LBC-NVK in Belgium) or certain regions (ELA-STV and LAB Sindikatua in the Basque Country in Spain; LBC-NVK in the Flemish Region in Belgium). In some cases, unions only cover a subsector within the graphical industry, coupled with other activities outside. For instance, FASAP FO and SNP CTFC in France only cover newspaper printing and combine this with live performance and audiovisual activities; SEKO in Sweden only covers the printing of banknotes and other security papers, combined with other activities in communication and services outside the graphical industry. Overlap is the dominant sector-related domain pattern in the graphical industry. It occurs in 53% of cases (29 trade unions). It is because of two main different modes of demarcation. The first one refers to general or cross-sectoral domains (GWU and UHM in Malta, SIMA in Portugal, NSZZ ‘Solidarnosc’ in Poland, Unite in the UK). The second, and more frequent, mode in the sector relates to various forms of multi-sector domains. In some cases, the domain includes all services (CNV in the Netherlands, ver.di in Germany, FSC-CCOO and FSP-UGT in Spain) or all manufacturing branches (such as FIEQUIMETAL, SINDEQ and SINDETELCO in Portugal). In other cases, the domain is more restricted and closely related to the graphical industry but includes activities such as communication, mass media, live performance, cultural activities (FILPAC-CGT and F3C CFDT in France, OMTVX and the Greek National Graphical Industry Workers’ Union in Greece, SLC-CGIL, FISTEL - CISL, Uilcom – Uil and UGL Carta e Stampa in Italy, OGBL Syndicat Imprimerie, Média et Culture - FLTL in Luxembourg, and the Lithuanian Trade Union Federation of Cultural Workers LKDPF in Lithuania). Finally, sectionalism is recorded only in one trade union (OS TB in the Czech Republic). This is because the union does not cover the whole country (eight regions are not covered). The domain description of all the unions can be found in Table A3 in Annex 1. Membership of the sector-related trade union is voluntary in the 25 countries examined. The number of active trade union members differs widely, ranging from around 25,000 (Unite in the UK) to fewer than 1,000 (and lowest in LPNA in Latvia, SEKO in Sweden or DE UNIE in the Netherlands) (Table A1 in Annex 1). This considerable variation reflects differences in the size of the economy and the comprehensiveness of the membership domain, rather than the ability to recruit members. Therefore, density is a more appropriate measure of membership strength for comparative analysis. In this context, it should be noted that density figures in this section refer to net ratios, which means that they are calculated on the basis of active employees only, rather than taking all union members (those who are in work and those who are not) into account. This is mainly because research usually considers net union densities as more informative than gross densities, since the former measure tends to reflect unionisation trends among the employees more quickly and accurately than the latter, since only employees are capable of taking industrial action. When looking at sector density (again referring only to active members), it is important to differentiate between the trade unions’ sectoral density and their domain density. The domain, or overall density, must be higher than the sectoral density if a trade union organises a particular part of the sector – that is, where the trade union’s membership domain is sectionalist – and equally if a trade union organises the whole sector as it is defined in the study – that is, where the trade union’s membership domain is congruent. This study only examines sectoral density. 28% (five) of the trade unions record a sector density rate of less than 5% of employees in the sector. Bearing this in mind, it can be stated that low and very low sectoral densities prevail in the sector. However, these figures must be read with caution due to the low percentage of trade unions that recorded information on sectoral membership. In total, 46 sector-related employers’ organisations are identified; 11 countries record only one employer organisation, seven countries record two employer organisations, three countries three employer organisations and two countries four or more employer organisations. Employer organisations are involved in collective bargaining in 18 countries (Table A5 in Annex 1). In five countries (Bulgaria, Estonia, Greece, Hungary and Malta) none of the sectoral employer associations included in the study is involved in collective bargaining. In the UK, one of the employer associations included in the study is not involved in collective bargaining (BPIF). Generally, business organisations may also deal with interests other than those related to industrial relations. Organisations specialising in matters other than industrial relations are commonly defined as ‘trade associations’ (see Behrens and Traxler, 2004). Bearing this in mind, it could be assumed that all eight organisations not involved in collective bargaining (see Table A5 in Annex 1), either primary or exclusively act as trade organisations in their country. All these organisations are members of the sectoral European-level employer organisations. In this sense, according to the selection criteria described above, all national organisations affiliated to the European-level employer association are included in the study irrespective of whether they are involved in collective bargaining. It is worth noting the case of Greece, where the three organisations included are neither involved in collective bargaining nor affiliated to the European employer association Intergraf. However, an unsuccessful attempt to conduct collective bargaining in the graphical industry was made in 2013. Moreover, in this country, the three employer organisations included were involved in sectoral collective bargaining until 2012, when a Ministerial Decision (No. 6/2012) imposed by the Troika, ruled the expiration of all collective agreements in force which were of indefinite duration or which lasted more than three years. 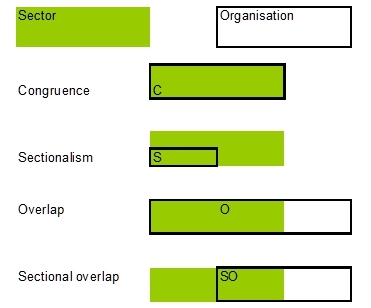 With regard to the domain patterns of the employer organisations, sectionalist overlap is the most widespread domain pattern, although followed closely by the others (Figure 5 and Table A6 in Annex 1). 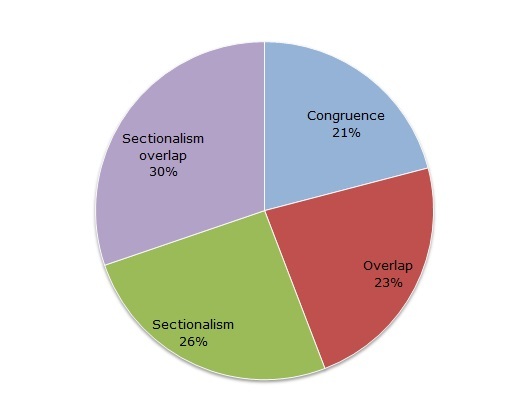 Sectionalist overlap occurs in 30% of the cases. It is usually explained by domain demarcation which excludes some activities or subsectors within the graphical industry (such as printing, pre-press or pre-media activities), or covers only certain companies (such as small ones or artisan manufacturers) and other activities outside the sector such as packaging (GA in Denmark), flexographic, engraving, further processing or media companies mainly producing text, audio- and picture formats for digital media (bvdm in Germany), or high-tech and communication activities (CNA in Italy). Sectionalism occurs in 26% of the cases. It is caused by domain demarcations which cover only certain companies, such as small and medium enterprises (Confartigianato Grafici in Italy), or cover only some specific subsectors within the graphical industry. For instance, several organisations do not cover newspaper printing (Pancyprian Master Printers Association in Cyprus and FEIGRAF in Spain) while others cover only this subsector (AEDE in Spain). Cases of domain overlap (23% of the cases) arise from employer organisations that have a cross-sectoral domain (ZDS in Slovenia, addressed to all industrial employers) or from organisations that cover different sectors and activities outside the graphical industry, such as suppliers to printing (BPIF in UK), printing and paper making (Nyomda- és Papíripari Szövetség in Hungary) or the entire media sector (VKL in Finland). Finally, 21% of the associations show a membership domain that is more or less congruent with the sector definition. This means that the domain of these organisations largely focuses on the graphical industry as defined for the purpose of this study. Accordingly, more employer organisations than trade unions (11%) are developing their activities according to the sectoral definition used in this study. A first aspect to note is that only in Austria do sector-related employer organisations rely on obligatory membership. However, it is worth noting that the most important employer organisation in the graphical industry is the Association of Printing and Media Technology Enterprises (VDMT), a voluntary employer organisation which does not form part of the Austrian Federal Economic Chamber (WKO) structure. VDMT concludes by far the most encompassing sectoral collective agreement with the GPA-djp. As far as the sectoral density of the employer organisations is concerned, figures are available for 31 organisations in terms of companies and 10 organisations in terms of employees. Sectoral domain densities for companies vary greatly across organisations. Density is above 50% in some cases (FEIGRAF in Spain; FEBELGRA in Belgium; GA in Denmark) while it is less than 1% in several organisations (AEDE, Spain; GES, UK; SPP, Czech Republic; FIEG, Italy; Fédération des Scop de la Communication, France; Nyomda- és Papíripari Szövetség, Hungary). Sectoral domain density for employees show less variation, with six organisations having above 50% and only one below 1%. When information is available for both kinds of densities (10 cases), the sectoral domain densities of companies are lower than the densities in terms of employees. This could indicate a higher propensity of the larger companies to associate, as compared with their smaller counterparts. Tables A2 and A5 in Annex 1 list all social partners engaged in sector-related collective bargaining. Figure 6 shows the involvement of the organisations in collective bargaining. With regard to the trade unions, 92% of sector-related trade unions with available information record participation in collective bargaining. Some 42% show participation in multi-employer bargaining, 38% record participation both in single- and multi-employer bargaining, and 12% record participation in multi-employer bargaining only. As for employer organisations, 80% of all employer organisations with available information record participation in collective bargaining. Some 67.5% record participation in multi-employer bargaining, 10% record participation both in single- and multi-employer bargaining and 2.5% record participation only in single-employer bargaining (SPP in Czech Republic). The data presented in Table 4 provide an overview of the system of sector-related collective bargaining in the 28 countries under consideration. The importance of collective bargaining as a means of employment regulation is measured by calculating the total number of employees covered by collective bargaining as a proportion of the total number of employees within a certain segment of the economy (see Traxler et al, 2001). Accordingly, the sector’s rate of collective bargaining coverage is defined as the ratio of the number of employees covered by any kind of collective agreement to the total number of employees in the sector. All the countries, except Bulgaria, Estonia, Greece, Lithuania and Romania, record some form of collective bargaining in the graphical industry. However, only in a relatively low number of countries where multi-employer is the only bargaining level or the most important one, multi-employer collective agreements are more or less congruent with the sectoral definition used in this study. This happens in Austria, Belgium, France and Slovenia. In other countries, some activities such as newspaper printing or digital printing are excluded from the graphical industries’ collective agreements and/or have specific agreements. This happens, for instance, in Portugal, Sweden, Cyprus or Germany. In other countries, collective agreements in the graphical industry embrace activities that are included in this study’s definition, such as the packaging sector, publishing activities or media and cultural activities. This is the case in Spain, Denmark and Luxembourg. In Greece and Romania, there has been no collective agreement in force since 2012 and 2011 respectively. In Greece, an unsuccessful attempt to conclude collective bargaining in this sector was made in 2013. Attention should also be drawn to the case of Slovakia, where only single-employer bargaining occurs and trade unions are not directly involved in the negotiation of agreements. Company collective agreements are concluded by the so-called basic organisations operating in these companies, some of which have direct links with sectoral trade unions. This situation explains why there are collective agreements in force in Slovakia but no trade unions recorded. The sector’s collective bargaining coverage differs widely by country, as outlined Table 5. However, it is possible to identify nine countries, mostly Nordic and Centre-West EU countries that record high collective bargaining coverage exceeding 80%. These countries are Austria, Belgium, Luxembourg, Portugal, Spain, Finland, France, the Netherlands and Sweden. Attention should be drawn to Austria. Although, within the Austrian collective bargaining system, extension practices are unusual, the most important collective agreement in force in the graphical industry includes this practice. This situation is because the employer organisation that concluded this collective agreement, the Association of Printing and Media Technology Enterprises (VDMT), is a voluntary employer organisation which does not form part of the Austrian Federal Economic Chamber (WKO) structure. This configuration is unusual in Austria since most private sector collective bargaining is carried out by the responsible branch subunits of the mandatory WKO. In the case of the graphical industry, although all the companies active in this sector have to be a member of the responsible WKO-branch subunit, that is the Association of the Graphical Industry (Fachverband Druck, FV Druck), the voluntary VDMT is the lawful bargaining party because the Austrian Labour Constitution gives voluntary associations the privilege to conclude collective agreements over mandatory associations. Since not all sectoral companies are members of VDMT, the sectoral agreement covers only the member firms and thus about 68% of the sector’s employees. However, through an extension order issued by the Federal Arbitration Board in April 2014 the sectoral collective agreement was extended to include employment relationships of essentially the same nature which are not covered by the agreement. As a consequence, the collective bargaining coverage rate in the sector comes close to 100%. It is also worth noting the Portuguese situation. In 2009, the Portuguese Ministry of Labour used, for the first time, the legal opportunity of issuing a ‘mandatory arbitration’. This decision referred to the branch agreement signed on the employer side by APIGRAF and on the union side by STICPGI/CGTP in the graphical sector (except printing). In the following year (2010), the ministry extended this decision at the request of the signatories APIGRAF and STICPGI/CGTP (and also by the unions SINDETELCO/UGT, SINDEQ/UGT and FETESE/UGT) by decree to the entire graphical industries sector. Since then, no further collective agreements have been signed in the sector and the mandatory arbitration is still in force. There is also a second group that can be identified, of countries with collective bargaining coverage rates that oscillate between 35% and 70%. These countries are Cyprus, Germany, Denmark, Slovenia, Croatia and Malta. A third group of four countries, mostly Centre-East EU countries, record collective bargaining coverage rates lower than 30%. These countries are the UK, the Czech Republic, Hungary and Slovakia. In Slovakia, however, collective bargaining takes place only at company level, where single-employer collective agreements are concluded at some companies. Company collective agreements are concluded by some specific trade union organisations placed at the company level (so-called basic organisations of the association ZO OZ). These organisations are not trade unions and were therefore not included in the national contribution to this study. In general, several factors which sometimes interact with each other explain differences in collective bargaining coverage rates. In all the countries that record high collective bargaining coverage rates, multi-employer is the only bargaining level or the most important one. Also, extension practices, whether pervasive or limited, exist in all these countries. However, the four countries that record low collective bargaining coverage rates, lower than 30%, are characterised by the predominance of single-employer bargaining. Thus, in the Czech Republic, Hungary and Slovakia, collective bargaining is carried out only at company level while, in the UK, single-employer is the dominant bargaining level. they may be represented on ‘corporatist’, in other words tripartite, committees and policy consultation boards. This study considers only cases of consultation and corporatist participation which explicitly relate to sector-specific matters. Consultation processes can be wide-ranging and, therefore, the organisations consulted by the authorities may vary according to issues to be addressed and also depend on changes in government. Moreover, consultation may be occasional rather than regular. Some 33 of the 44 (75%) sector-related trade unions with available data have been consulted. Authorities consult unions in all the countries in which there are sector-related unions except Cyprus, the Czech Republic, Germany, Poland, Portugal and Slovenia. Only eight trade unions report that they are regularly consulted. These trade unions are in Belgium, Denmark, Finland and Latvia. Since there is a multi-union system in 16 of the 25 countries with sector-related trade unions, the authorities favouring certain trade unions over others cannot be ruled out, nor can unions competing for participation rights. In almost all countries with a multi-union system where a noticeable practice of consultation is observed, any existing trade union may take part in the consultation process. In contrast, in Spain, only some of the sector-related trade unions are consulted, while in other countries information about consultation is available only for some unions (France, Ireland, Italy, Luxembourg and Sweden). Authorities consult 32 of the 39 (82%) employer organisations. Employer organisations are consulted by the government in all the countries with sector-related organisations except in Cyprus, the Czech Republic and Slovenia (no available information in Ireland). Some 12 organisations are regularly consulted in the following countries: Austria, Belgium, Denmark, Finland, Italy, Latvia, Portugal and the UK. From the countries with a multi-organisation system where a practice of consultation is recorded, in Belgium, France, Latvia, the Netherlands and Sweden, all the existing employer organisations may take part in the consultation process. However, in Greece and Spain, only some of the existing employer organisations take part in the consultation process. In the case of Austria, Italy and the UK, there is no information available for all the organisations. Genuine sector specific bodies have been established in 15 of the 28 countries under consideration (Table 6). Sector-specific bodies, whether bipartite or tripartite, have been established in Belgium, Bulgaria, the Czech Republic, Denmark, Finland, France, Germany, Greece, Hungary, Ireland, Italy, Latvia, Slovakia, Sweden and the UK. In Bulgaria, however, social partners report that the tripartite body has not been active in recent years. In Denmark, Finland, France and the UK, there are several bodies dealing with different issues. Only a few countries report information about the scope of activity of the tripartite and bipartite bodies. When information is available one can find bodies dealing with general working conditions (Bulgaria), social dialogue issues except wages (the Czech Republic, Hungary), safety at work and occupational well-being (Finland and the UK), education or vocational training (Denmark, Finland, Italy, Sweden), the environment (Denmark), management of social security funds and pensions (Greece and the UK), and employment and working conditions (Slovakia). have adequate structures to ensure their effective participation in the work of the committees. In terms of social dialogue, the constituent feature is the ability of such organisations to negotiate on behalf of their members and to conclude binding agreements. This section will analyse these organisations’ membership domain, membership composition and capacity to negotiate of European associations in the graphical industry. The study presents detailed data on one sector-related European association on the employee side (UNI Europa Graphical) and one on the employer side (Intergraf). Both associations are members of the European Social Dialogue Committee of the graphical industry and are listed by the European Commission as social partner organisations consulted under Article 154 of the TFEU. The following analysis concentrates on these organisations. According to its website, UNI Europa Graphical belongs to UNI Graphical & Packaging, the global union that claims to represent 800,000 members from over 150 trade unions. UNI Europa Graphical works together with the European Trade Union Confederation (ETUC), acting as the ETUC’s recognised industry federation for the graphical and allied industries. According to its website, Intergraf promotes and protects the interests of the printing and graphic industry in Europe. It has 22 members in 20 European countries, including countries outside the European Union (Switzerland and Norway). Its main task is to promote and enhance the interests of the printing and digital communication industries and to work with the European institutions to support the sectors’ competitiveness. Table 7 provides a list of membership-related trade unions for UNI Europa Graphical drawn from the country reports. This membership list is confined to the sector-related associations of the countries under consideration; hence it does not include trade unions affiliated to the European-level organisations which do not have any members in the graphical industry. The membership of the employee organisations is obtained through the membership list provided by the organisations and a further check of the membership lists published on the organisations’ web pages. In 21 out of 25 countries with sectoral-related unions, at least one sectoral affiliation to UNI Europa Graphical is found. In Bulgaria, Estonia and Slovakia, the study did not identify trade unions meeting the criteria to be included. The four countries in which there is no sectoral affiliation are the Czech Republic, Greece, Ireland and Romania. UNI Europa Graphical has 28 direct affiliations from the 21 countries under consideration. Therefore, 51% of the trade unions listed in Tables A1 and A2 in Annex 1 are directly affiliated to UNI Europa Graphical. Some 26 out of the 28 trade unions affiliated to UNI Europa Graphical are involved in sectoral collective bargaining. LKDPF in Lithuania and LPNA in Latvia are not involved. Moreover, all the unions affiliated to UNI Europa Graphical cover the sector in all the regions of their countries except LBC-NVK in Belgium, which is active only in the Flemish region. Although the coverage of organisations recorded by UNI Europa Graphical in the graphical industry may seem relatively low at first glance (51%), a comparison with other European trade unions present in other Sectoral Social Dialogue Committees (see the representativeness studies on woodworking, electricity, chemical, textile and clothing, or food and drink) reveals that it is in fact close to the average. Bearing this in mind, it is important to check if some major national trade unions are not covered. For this purpose, it can be assumed that major trade unions are those that are active in the whole country, conduct collective bargaining, have a relatively high level of membership and have opportunities to intervene in the national decision-making process. The analysis of the organisations which are not affiliated to UNI Europa Graphical reveals that there are 20 trade unions not covered in 13 countries that are involved in collective bargaining, from which only three are exclusively involved in single-employer bargaining. All these organisations are active in the whole country except the two trade unions not covered in Spain, which are active only in the Basque Country (LAB Sindikatua and ELA-STV). From these 20 trade unions, 11 are also consulted by public authorities in issues affecting the sector. Sectoral density rates are only available for five of these trade unions and only two of them record densities higher than 5%: UHM in Malta (33%) and the Irish Print Group in Ireland (21%). (The Irish Print Group is part of SIPTU, which is affiliated to UNI Europa. However, the Irish Print Group is not a direct member of Uni Europa Graphical.) These could be considered major trade unions not covered by UNI Europa Graphical. Table 8 lists the employer organisations’ members of Intergraf. Again, this membership list is confined to the sector-related associations of the countries under consideration; hence it does not include employer organisations affiliated to the European-level organisations which do not have any members in the graphical industry. Intergraf has 20 sectoral affiliations in 18 countries (two sectoral affiliations in Austria and the UK). Therefore, 43% of the employer organisations listed in Tables A4 and A5 in Annex 1 are directly affiliated to Intergraf. As previously shown, there are no sector-related employer organisations in Croatia, Lithuania, Poland, Romania or Slovakia. Therefore, the five countries in which there is no sectoral affiliation to Intergraf are Cyprus, the Czech Republic, Greece, Ireland and Slovenia. It is worth noting that the Greek employer association SEMEE cancelled its affiliation in 2012. Some 15 out of the 20 employer organisations affiliated to Intergraf are involved in sectoral collective bargaining. However, all the employer organisations affiliated to Intergraf cover the sector in all the regions of their countries except GES in the UK, which is active only in Scotland. Again, although coverage of organisations recorded by Intergraf in the graphical industry (43%) may seem relatively low at first glance, a comparison with other European employer organisations present in other Sectoral Social Dialogue Committees (see the representativeness studies on woodworking, electricity, chemicals, textile and clothing, or food and drink) reveals that it is close to the average. Accordingly, it is necessary to check if some important employer organisations are not covered. For this purpose, it can be assumed that important employer organisations are those that are active in the whole country, conduct collective bargaining, have a relatively high level of membership and have opportunities to intervene in the national decision-making process. This analysis reveals that 18 out of the 27 organisations not covered are party to collective bargaining. These 18 organisations are present in nine countries and all of them but one (ADEGI in Spain) are active in the whole country. Thus, in some countries with a pluralistic or semi-pluralistic employer organisation system (Austria, Belgium, Italy, the Netherlands, Spain and Sweden), some of the organisations involved in collective bargaining are not members of Intergraf. Of these 18 organisations involved in collective bargaining, 14 of them are consulted by public authorities on sector-related issues. Sectoral density rates in terms of companies are available for 11 employer organisations out of those 18 involved in collective bargaining (rates in terms of employees are only available for one organisation). Only three employer organisations record a sectoral density rate higher than 10%: BI KHW in Austria (13%), Confartigianato Grafici in Italy (37%) and Almega in Sweden (15%). These could be considered important employer organisations not covered by Intergraf. The European sectoral social partners should be able to prove their capacity to negotiate on behalf of their members and to enter into ‘contractual relations, including agreements’ (Article 155 TFEU), for example, the capacity to commit themselves and their national affiliates. This criterion refers to the capacity to negotiate agreements as provided for in Article 155 of the TFEU; negotiating other types of joint texts such as joint opinions, frameworks of action and guidelines is not considered to be sufficient in this context. A European organisation has the capacity to negotiate such an agreement if it has received a mandate to do so from its affiliates, or if it can receive such a mandate in accordance with a given mandating procedure. The mandate/mandating procedure can be either statutory, that is laid down in the statutes (constitution) of the organisation or annexed to them, or non-statutory, that is laid down in secondary (formal) documents, such as rules of procedures, memoranda of understanding or decisions by the governing bodies of the organisation. The mandate will be described in terms of the conditions and procedure for the European social partner organisation to be given the authorisation to enter into a specific negotiation, as well as for the ratification of a possible agreement. If no such formal mandating procedure can be identified, it should be considered that the condition concerned is not fulfilled. In order to check this criterion, the European social partners from the graphical industry, Intergraf and UNI Europa Graphical, were asked to provide proof of their statutes or any other written documentation, describing their mandate and capacity to negotiate, as well as the ratification procedures in place within their organisation. When Intergraf was queried in 2013 about its capacity to negotiate agreements in the context of the preliminary assessment of representativeness in view of the creation of the sectoral social dialogue committee, it replied that it has such capacity, as it ‘is recognised as [the] official representative of the employers of the graphic industries at European level. Its members have the capacity to negotiate collective agreements at national level’. According to Intergraf legal statutes, the General Assembly, which is its governing body, has full power to carry out Intergraf’s goals, which include issues such as approval of budgets or the exclusion of member associations but there is no reference to social dialogue or the negotiations of agreements (Article 11). A general mandating procedure is in place, within the General Assembly. The General Assembly comprises delegates solely from the member associations. The voting rights of the member associations are proportional to their individual membership fee (Article 12). The General Assembly meets once a year (Article 13) and can make valid decisions only if more than half of the member associations and more than half of the votes are present or represented. In any vote, a member association may be represented by another association to which it has given a written proxy. One member cannot hold more than three proxies. Decisions of the General Assembly require a majority of at least two-thirds of the votes cast, regardless of abstentions (Article 15). When it comes to binding agreements with the unions in the graphical industry, Intergraf cannot make a decision alone. This has to be suggested and mandated by the organisation’s Board and go through the General Assembly to be ratified by Intergraf members. If mandated by the Board, Intergraf can negotiate with UNI Europa Graphical, as it has done in the past regarding co-signed letters and joint statements. Until now, the question of binding agreements to be negotiated at EU level with UNI Europa Graphical has not been part of social dialogue in the sector. Based on this, one can conclude that Intergraf has a statutory mandating procedure, which can be used, in principle, to obtain a mandate to negotiate agreements. As far as UNI Europa Graphical is concerned, it has three governing bodies: the UNI-EG Conference, the UNI-EG Biennial General Meeting, and the UNI-EG Steering Committee. The UNI-EG Conference is held every four years and the UNI-EG Biennial General Meeting every two years. The UNI-EG Steering Committee is elected every fourth year by the UNI-EG Conference and meets every quarter and when deemed necessary by its members. However, the statutes do not say anything about the power and capacity of the Steering Committee in order to achieve agreements on behalf of the UNI Europa Graphical members or of any mandating procedure. It should, nevertheless, be noted that the statutes of UNI Europa, UNI-EG’s mother federation, do explicitly refer to collective bargaining and negotiating agreements. The fact that one of the objectives of UNI-EG is to ‘further the objectives as set out in the UNI-Europa Statutes within its own sphere of influence’ seems to indicate that collective bargaining does also form part of UNI-EG’s possible means of action. to encourage and develop all dimensions of the social dialogue in the sector at all levels. Although the negotiation of agreements as per Article 155 TFEU is not explicitly mentioned among the goals of the European Social Dialogue Committee, one could consider that the last objective (‘all dimensions of the social dialogue (…) at all levels’) would not exclude this possibility. As final proof of the weight of UNI Europa Graphical and Intergraf, it is useful to look at the other European organisations to which the sector-related trade unions and employer organisations are affiliated. The affiliations of the trade unions are listed in Table A2 in Annex 1. Several European organisations other than UNI Europa Graphical can be found. According to the bottom-up approach, there are five European organisations mentioned here, which cover at least three countries: the European Federation of Public Service Unions (EPSU), IndustriAll Europe, the European Federation of Food, Agriculture and Tourism Trade Unions (EFFAT), the European Federation of Building and Woodworkers (EFBWW), and the European Transport Federation (ETF). ETF, EFBWW and EFFAT are present in three countries, IndustriAll Europe in four countries and EPSU in five countries. It is worth noting that the bottom-up approach can be expected to underestimate the number of organisations affiliated to those European trade unions. According to the information provided on the websites of the various organisations, they are present in more countries than the bottom-up approach may suggest. The presence of these organisations reflects the overlapping domains of many trade unions, because these organisations do not claim to attract unions belonging to the graphical industry. Thus, no relevant competitor is identified on the employee side. A similar review of the membership of the national employer/ business associations can be derived from Table A5 in Annex 1. In this case, only the Federation of European Screen Printing Associations (FESPA) appears to be relatively important, being present in six countries (Austria, Belgium, Denmark, Germany, the Netherlands and Portugal). However, it must be noted that this is only the outcome of the bottom-up approach. Indeed, FESPA is present in 20 Member States. The reason to exclude the other 14 organisations from the study is that they do not meet the criteria for inclusion; being either regularly involved in sector-related collective bargaining and/or being affiliated to Intergraf. Bearing this in mind, it can be concluded that the excluded national associations either primarily or exclusively act as trade associations. It is also worth noting that FESPA covers only screen printing activities (electrophotography and inkjet in total printing), which, according to Intergraf, account for around 3% to 4% of the entire graphical industry (Smithers Pira, 2015, p. 58). In this sense, the association appears to have a very specialised domain within the sector. A pluralist national associational system prevails in many of the countries on both sides of the industry, but to a lesser extent on the employer side. Thus, 16 EU Member States record more than one trade union, while 12 Member States record more than one employer organisation. Some countries do not record national social partners. Bulgaria, Estonia and Slovakia do not record sectoral trade unions while there are no employer organisations in Croatia, Lithuania, Poland, Romania and Slovakia. In some of the countries that do not record national social partners that meet the criteria to be included in this study, there is no sector-related collective bargaining in force (Bulgaria, Estonia, Lithuania and Romania). However, in Croatia, Poland and Slovakia, there are company collective agreements in force. In Croatia and Poland, trade unions conclude company collective agreements directly with the sectoral enterprises. In Slovakia, company collective agreements are concluded by some specific trade union organisations placed at the company level. The domain demarcation of both trade unions and employer organisations shows that the sector, as it is defined in this study, does not cover the same reality in most of the Member States. This lack of congruence between the sector definition and the sectoral domain of the social partner organisations is higher among trade unions. Only six trade unions (around 11% of all the unions) show a membership domain that is more or less congruent with the sector definition compared with nine employer organisations (around 21% of all the employer organisations). The domain of the employer organisations tends to be narrower than the domain of the trade unions. 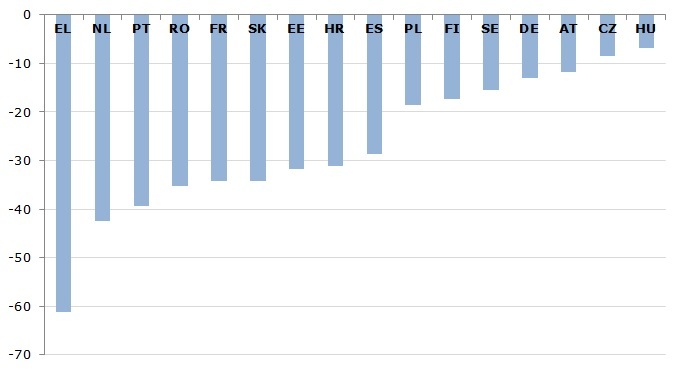 Moreover, only in a relatively low number of countries, where multi-employer is the only bargaining level or the most important one, are multi-employer collective agreements more or less congruent with the sectoral definition used in this study (Austria, Belgium, France and Slovenia). Although the situation differs widely among countries and organisations, statistics show that densities are lower for trade unions than for employer organisations. However, lack of figures for many organisations would suggest that these figures should be analysed with caution. The sector’s collective bargaining coverage (taking extension into account) widely differs by country. A group of nine countries record high collective bargaining coverage, exceeding 80%. A second group of countries records collective bargaining coverage rates of between 35% and 70%. A third group of four countries record collective bargaining coverage rates lower than 30%. In general, the predominance of single-employer bargaining and the lack of extension practices are features found in the countries that record the lowest collective bargaining coverage rates. A high proportion of trade unions (75%) and employer organisations (82%) are consulted by the national governments. Moreover, the study shows that genuine sector-specific bodies have been established in 15 of the 28 countries under consideration. Finally, top-down and bottom-up analyses reveal the following issues with regard to the two sectoral European-level social partner organisations analysed in this study. UNI Europa Graphical has 29 direct affiliations from the countries under consideration (51% of all the trade unions identified) and 27 of them are involved in sectoral collective bargaining. The analysis of the trade unions not covered by UNI Europa Graphical reveals that there are 20 trade unions not covered in 13 countries that are involved in collective bargaining, from which 14 are also consulted by public authorities in sector-related issues. Accordingly, some relatively major national trade unions may not be covered. Intergraf has 20 sectoral affiliations in 18 countries (43% of all the employer organisations identified) and 15 of them are involved in sectoral collective bargaining. As far as the 27 national organisations not covered by Intergraf are concerned, it is worth noting that 18 of them are party to collective bargaining. These 18 organisations are present in nine countries and all of them but one (ADEGI in Spain) are active in the whole country. From these 18 organisations involved in collective bargaining, 14 of them are also consulted by public authorities in sector-related issues. Top-down and bottom-up approach analyses of the graphical industry in the EU28 show that UNI Europa Graphical and Intergraf are the most important European-level social partner organisations within the graphical industry, based on their membership. Analysis of the legal statutes of both organisations reveals that Intergraf has a general mandating procedure that can be used to obtain a mandate to negotiate agreements on behalf of its members as set out in Article 155 of the TFEU. UNI Europa Graphical does not have a statutory mandate to negotiate agreements on behalf of its members as set out in Article 155 of the TFEU, but its mother federation, UNI Europa does. European Commission (2014), Industrial relations in Europe 2014, Publications Office of the European Union, Luxembourg. Traxler, F., Blaschke, S. and Kittel, B. (2001), National labour relations in internationalised markets, Oxford University Press, Oxford. Notes: See Table A3 further below for a more detailed description of the trade unions’ membership domain with regard to the sector. n.a. = not available. Annex 2 presents a full list of country codes. European Federation of Public Service Unions (EPSU), European Trade Union Confederation (ETUC), European Union Network (UNI Europa), European Workers’ Education Association (EURO WEA), Federation of Europe Retired Personal Association (FERPA), Council of European Professional and Managerial Staff (Eurocadres), European Transport Federation (ETF), European Federation of Building and Wood Workers (EFBWW), European Metalworkers Federation (EMF), European Federation of Trade Unions in the Food, Agriculture and Tourism Sectors and Allied Branches (EFFAT). Public Services International (PSI), International Trade Union Confederation (ITUC), International Labour Organization (ILO), International Transport Workers’ Federation (ITF), International Union of Food, Agriculture, Hotel, Restaurant, Catering, Tobacco and Allied Workers’ Association (IUF), International Federation of Building and Wood Workers (IFBWW), International Metalworkers’ Federation (IMF), International Federation of Chemical, Energy, Mining and General Workers’ Union (ICEM), International Textiles, Garment and Leather Workers’ Federation (ITGLWF), Union Network International (UNI), International Federation of Musicians (IFM) and the International Federation of Workers’ Education (IFWEA). Confederation of Malta Trade Unions (CMTU), European Organisation of Public Service Employees (EUROFEDOP), International Organisation of Public Service Employees (INFEDOP). Being a member of the CMTU, the UHM is indirectly affiliated with the European Trade Union Confederation (ETUC), Commonwealth Trade Union Council (CTUC), the European Federation of Retired and Elderly Parents (FERPA), and the International Trade Union Confederation (ITUC). UNI Europa, European Federation of Building and Woodworkers (EFBWW), European Federation of Food, Agriculture and Tourism Trade Unions (EFFAT), European Federation of Public Service Unions (EPSU), European Transport Workers’ Federation (ETF), IndustriAll European Trade Union. UNI Global Union, Building and Wood Workers’ International (BWI), IndustriAll Global Union, International Transport Workers’ Federation (ITF), International Union of Food, Agricultural, Hotel, Restaurant, Catering, Tobacco and Allied Workers (IUF), Public Services International (PSI). Notes: See Table A6 for a more detailed description of the employer organisations’ membership domain with regard to the sector. n.a. = not available. Craftwork Employers’ Association (UPA), representing self-employed craft workers; Intergraf. Private, national and multi-national companies in the graphical industry and flexographic, engraving, further processing or media companies mainly producing text, audio- and picture formats for digital media. All companies in the graphical industry, printing houses, graphic art suppliers, paper merchants and graphic art school. All companies in the graphical industry, packaging producers, merchants), package treatment company Latvijas Zaļais punkts, education institutions. All companies in the graphical industry and suppliers to the graphical industries.